Are Atheists Insecure about their Worldview? In this article, I am interested in observing the sociological phenomenon concerning the Atheist community as it relates to falsely labeling, and in extreme cases, deifying particular scientists against their will. Moreover, there is a pattern in the Atheist community to associate historical persons as having a nonreligious disposition despite strong evidence to the contrary. For example, Neil DeGrasse is associated with Atheism, even though he has publicly stated his preference to be called a scientist. In addition, Carl Sagan was an Agnostic more closely aligned with the philosophical beliefs of Spinoza–Pantheism, than he would be of Atheism as we know it today. Not sure how Mr. Sagan would react today by the deification of his being, Saganism, and the wide following by Atheists. The picture presented in this article is an example of false branding of historical persons by the Atheist community. Firstly, Jefferson was a Deist and antagonistic towards Christianity, but definitely not an Atheist. Secondly, Albert Einstein, similar to Carl Sagan, followed the beliefs of Spinoza and considered god to be impersonally detached from the cosmos. Thirdly, Abraham Lincoln revered the Bible. Not sure how he made it. Fourthly, Charles Darwin absolutely believed in evolution, but believed God was in control of the natural processes involved–Theistic Evolution. Fifthly, Mark Twain was certainly non-religious and despised the teachings of Christian Science by Mary Eddy Baker, but he wrote in his dialogue Three Statements of the Eighties, “I believe in an Almighty God, but not in revelation.” Lastly, Benjamin Franklin was a friend of George Whitefield, the greatest Anglican cleric and evangelist responsible for the spread of the Great Awakening. My point is merely to observe the sociological phenomenon involved with Atheism as it relates to incorrectly labeling, profiling, and in extreme cases, deifying particular humans to legitimize their worldview. Of course, I am open to understanding more about the psychology involved in the Atheistic community and whether or not this sociological phenomenon directly affects their atheistic tendencies or not. wrong, wrong, and wrong in three different meanings. you do not understand atheism. you do not know their mindset. and if you bothered, you’d know … just like you’d know jefferson was a christian; just sans platonistic mumbo jumbo about trinitarianism and deification of christ … in fact, he at length discussed the whole of it in the jefferson bible. this kind of nonsense distresses me as a christian, but more, as a human being. Hey Steven, thanks for your response. My point was not to discredit Jefferson’s position on God; in fact, I agree with you that Jefferson was a religious man. He didn’t associate himself with Atheism. My whole point was to argue that Jefferson should not be attributed in the Atheist poster since he did posit the existence of a Creator. However, the very fact that Jefferson wrote his own bible indicates he had issues with it. For one, he didn’t believe that miracles were plausible in the natural world. Consequently, every bible verse that mentioned a miracle from Jesus, such as healing the blind, raising the dead, and casting out demons, were omitted. Jefferson didn’t believe that God personally intervened in this world or he would have accepted miracles as justifiable. Since Jefferson had difficulty accepting the personal intervention of a deity, he objected to the historical position of Christianity and took more of a liberal view. You also claimed that I do not understand Atheism or their mindset, but the point of this article was not to discuss the views of Atheism. 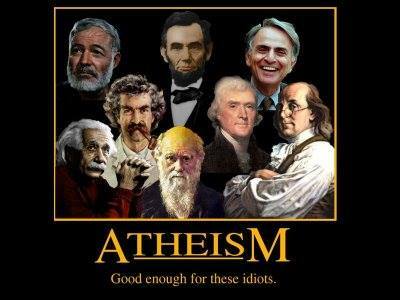 Rather, it was to argue that the historical persons represented by the Atheist poster are not historically grounded. Those individuals had a belief in the existence of a Creator. Personally, I do care about Atheists. I attend Secular Student Alliance clubs and interact with unbelievers in my local community. Ad hominem attacks against my character is not a good start to a healthy dialogue. I am open to hearing your criticisms, but please provide evidence that demonstrates my faulty assumptions and I will change my position on the matter. Have a great day! your article is about an atheist “worldview”. well, sir, no such thing exists! atheists simply reject the idea that we can assert there are gods. they will of course say there may be gods, and they may of course believe there are none. however, i know of few atheists willing to assert what they believe is actually the case. they will say they simply don’t know if it is the case case. that is where all commonality ends with atheism. each will and do have all sorts of views about the world from there, and it doesn’t make sense at all for you to project on them. by that, i mean of course YOUR view of everything about the world centers around an idea about god. theirs does not. you start with god and weave god into every experience and thought you have. god is minus every fiber of the tapestry of theirs. and finally, deifying things is what you do. atheists may hold people in high regard, even jesus christ. but again, unlike you, they don’t deify them. if you take a second to actually understand the atheist, then you’ll understand the meme. each person should be admired for the ways in which they are not the kind of christian they meet every day; darwin loved god and didn’t put interpreting scripture over facts, like augustine and aquinas, who would also not hesitate to change in light of the fact of evolution. and so, we can see too why they find christians like darryl faulk and francis collins quit admirable too. each of those in the meme in some way represent defiance of christian stupidity … which is encapsulated in the very text of the meme! i don’t know, but that’s sure how it comes off. but as to your own personal understanding of each of the folks in the meme, i won’t argue each one; their isn’t room. so i take jefferson. if you only fail to admit jefferson was a christian because he had “liberal” views, then you quite miss the point that he was, and, you have failed to ever look into the matter. as for him being a different kind of christian than you, you denying he was is to commit the unforgivable sin of grieving the holy spirit; denying the holy spirit was in him while the very fruits of that spirit were reaped in his life! you may care, but i don’t think in your caring, you understand, nor listen, nor have you compassion; after all, your entire intent here to suggest a monumental tu quoque and we really ought to just ask if you are secure in your worldview … because you project many of its features on others and defensively mis-characterize others from there. now, speaking that way, what barriers have you wedged between yourself and the atheists you “care” about? Fine, Einstein was a Pantheist. Whatever. But what’s that got to do with accusing us of having a worldview like the title says? Hello, to be quite honest with you, I didn’t realize there was a subtitle under Atheism until you mentioned it. I believe the poster was made by an Atheist, not one who rejects their worldview. I think the point they were trying to make is if Atheism is good enough for these people, who are “geniuses” not “idiots” than Atheism is a rational worldview that should be embraced. I was not accusing Atheism of having an irrational worldview. Rather, I was stating that Atheists sometimes accuse religious people of having rational inconsistencies, and they take intelligent people like the poster has, saying they were Atheist. But after doing research, I realized most on the list actually believed in some sort of deity or higher power. I have friends who are Atheists and I respect their position. I am open to differing views and embrace a healthy skepticism. Thanks for the comment and sorry if you felt the title was demeaning to the Atheist community. That was not my intention. Have a good day! Previous Post How was Jesus both Fully God and Fully Man?